Dr. Catalina Medencevic - George Lim Dental, DMD, Inc.
Dr. Catalina Medencevic graduated with her doctorate from the University of Southern California in 2004 and since then has been practicing dentistry in Los Angeles. With well-rounded interests in endodontics, cosmetics, and restorative dentistry, she continues to educate herself to stay current with clinical care. Dr. Catalina is an active member of the California Dental Association and the West Los Angeles Dental Society. When she isn’t practicing dentistry, she enjoys going to concerts, taking long walks, and camping and skiing in Big Bear with her husband, their two children, and their friends. 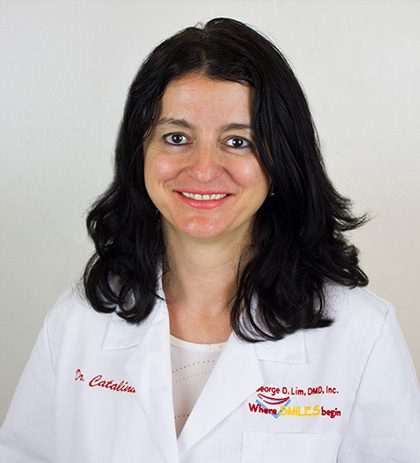 Dr. Catalina enjoys providing satisfactory care to all of her patients and practices with quality and careful dentistry.